16th century onwards. A long table designed to seat all the family. 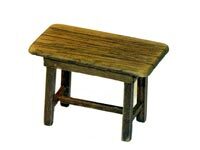 The table top rested on trestles, which were fixed in place by a central stretcher. During the early part of this period it was usual to sit on benches or settles; chairs were rare. 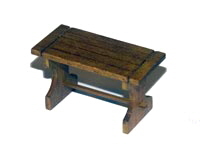 The stool was not only used as a seat but also for children to stand upon to reach the table. 1/24th - �30 the set. 16th century onwards. Often positioned by the fire in the living room/kitchen. A high back and sides to keep draughts away. 17th century onwards. 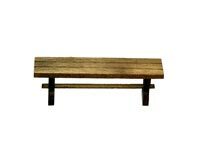 Used for storage and also additional seating. At this time bent nails were used as hinges. Such chests were still in use many centuries later. Late 18th century onwards. Hens will not lay in the cold, so they were brought indoors during the winter. The central section of the dresser lifted up to allow the hens in and out of the coop. 18th century onwards. 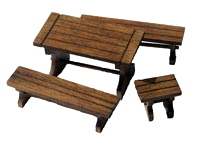 A basic planked table and two simple ladder-back chairs with wooden seats. These would have been made by local carpenters for the ordinary working classes. 1/24th - �34 the set. 19th century onwards. Most farms spun their own wool and so owned a spinning wheel. Originally, the wheel was hand-turned but later it had a treadle fitted to enable both hands to be used to wind and twist the wool. Complete with spinning chair. As above but comes straw-lined and with an assortment of at least three different chickens (actual chickens may vary from those shown). Mid 19th century onwards. Developed from the comb-back stick chair. Laths had replaced the earlier sticks and were topped by a heavy rail. The legs are joined by a H-shaped stretcher. 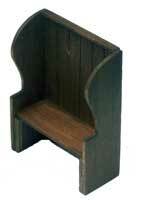 A popular seat in cottages and smaller homes, and for servants in better class houses. Middle Ages onwards. Stools were the most usual form of seating until chairs became more commonplace during the mid 17th century. From the 16th century (one was found in the wreckage of the Mary Rose). Used for carrying hot ashes from the fire. 18th century onwards. This type of dresser would be used in the kitchen with the base or pot board used for the storage of large pots, etc. Above this are three opening drawers and a fixed shelf unit on which to display plates. 18th century onwards. Stick-back chairs were made in country areas by local carpenters for many years before they were mass-produced and became known as Windsor chairs. This, the earliest type, had plain stick legs and a plain seat. 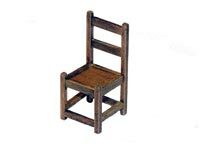 It was called a comb-back chair because the tall sticks at the back resembled a wide-toothed comb. Late 16th century onwards. Used for the storage of pewter, crockery, linen and dry foods. 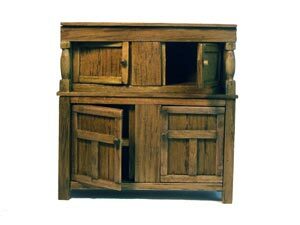 Virtually all Lakeland houses would have had a ‘bread cupboard’, as they were commonly known, for storing the home-made clap bread. 19th century onwards. This table has an opening drawer for utensils. The pine top provided a useful work surface, which after use would be scrubbed down, hence the pale colour. The spinning chair was designed to be very low with a high back and three legs. Commonly found upon the kitchen range. A food cupboard with gothic piercings to keep the food aired and fresh. The inside of these piercings were covered with cloth to keep flies and other insects from entering. Used in churches, called dole cupboard, to keep the food alms to be doled out to the poor. In large Tudor homes additional food and lighting materials were ‘delivered’ to the rooms of each member of the household and kept in these cupboards, hence the term livery cupboard. A dresser was originally a board or table on which to ‘dress’ the food before serving it. Later dressers had drawers or a cupboard below the table. Chairs were rare in this period and only the well-to-do possessed them. They were limited to the Lord and Lady in the large hall and may be in their bed chambers. 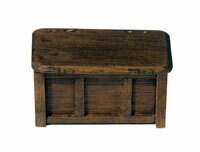 The carved oak box type (very upright and uncomfortable looking) was in general use until the late 16th century. It is believed that the first spinning wheel (charkha) was developed in India as early as 500 BC. It was not until the middle ages that it reached Europe and probably came to Britain from Holland. The Great Wheel is so called because it was usually over 5 feet tall. The spindle turned many times for each turn of the large wheel. The spinner turned the wheel clockwise with the right hand whilst holding the wool in the left hand. The spinner walked backwards, drawing the wool away from the spindle. A Victorian ceiling-mounted laundry airer. The airer is lowered by cords to load and unload laundry. It is then raised into the higher, warmer air out of the way. Often sited in front of the cast iron range. 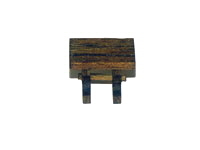 A square piece of wood with a circular hollow carved into the centre to hold the food. Some had a small hollow in one corner to hold a small amount of salt. This may be from where we get the phrase ‘to eat a square meal’. 18th century onwards. Spices needed to be kept dry, so a spice cupboard in which to store them was often fitted into the rear wall of an inglenook where the fire would ensure this.